Consensus Estimate - What Does It Mean? What does "consensus estimate" mean? 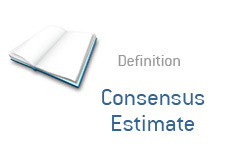 What is the definition of "consensus estimate"? You have likely heard the term "consensus estimate" if you watch a financial TV channel such as Bloomberg or CNBC, or read any financial web site. The "consensus estimate" comes when you take the analysts who are currently following a stock and average out their expectations for revenues and earnings. XYZ currently has six analysts that are following the company and publishing estimates. Instead of saying "Goldman Sachs is expecting 70 cents per share of earnings for Q3 and $880 million in revenues" and "Morgan Stanley is expecting 68 cents per share of earnings and $870 million in revenues", a single "consensus estimate" will be published. The consensus estimate is calculated by taking the estimates from all of the analysts who are currently publishing estimates for the company and averaging these numbers out. So, for instance, the consensus estimate for XYZ for Q3 may be 69 cents per share of earnings and 875 million dollars in revenues. This would represent an average of the six different estimates that have been calculated for the company. The "consensus estimate" is meant to give investors a general idea of what analysts are expecting a company to earn.